WILLEMSTAD – The European region registered 5% more visitors in the first quarter of 2014. A total of 49.931 European visitors were registered during this period. 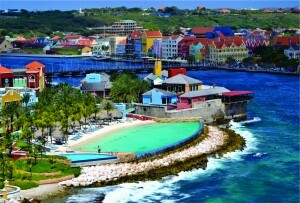 Last year in the same period CTB (Curaçao Tourist Board) counted 47.697 stay over visitors from the European region. The fact that Europeans flocked in greater numbers to our island also resulted in an increase of 1% in overall nights for the first quarter. Europeans spent on average more nights compared to the other regions. Despite the good performance of the European region, the overall stay over arrivals in the first quarter of 2014 recorded a decrease of 5%. All together, 108.067 stay over visitors were welcomed during the first three months of 2014. In 2013 Curaçao welcomed 113.503 stay over visitors. The South American region decreased by 19%. There were 24.847 South Americans in 2014 compared to the 30.732 visitors registered in 2013. The North American region decreased by 7% during 2014. A total of 20.218 visitors from this region were registered. The Caribbean region decreased by 13%, during the first three months of the year 2014 we welcomed 7.383 visitors from our neighbor islands. Utilizing the ‘Turistika Model’, CTB and MEO calculated that for the first quarter of 2014 the tourism sector was directly responsible for generating 102.0 million US dollars into the local economy. Last year the same period generated a total of 104.9 million US dollars. European stay over visitors, who visited Curaçao in greater numbers during the first three months of 2014, spent a total 50.6 million US dollars, about 49.6% of the total. They were followed by the North Americans who spent 21.5 million US dollars and the South Americans who spent 21.1 million US dollars. The Caribbean visitors spent a total of 5.0 million US dollars in 2014. The number of visitor nights is an important measurement rod to calculate the economic impact of the tourism sector in Curaçao. The overall nights spent on the island increased by 1%. All together visitors stayed 999.523 nights in Curaçao compared to 993.103 nights in the first three months of 2013. The European region recorded significant growth in total visitor nights with a 6% increase and 569.128 registered nights. In absolute figures this region claims the greatest share of visitor arrivals causing a positive impact on the overall number of nights. Moreover, Europeans spent on average more nights compared to the other regions. North America, South America and the Caribbean recorded less visitor nights. Respectively, 5%, 10% and 12%. In absolute numbers 148.752, 185.929 and 51.265 visitor nights. The share of the top 5 markets to Curaçao during the first quarter of 2014 is as follows: the Netherlands (34.8%), Venezuela (14.9%), United States of America (12.9%), Canada (5.8%) and Germany (4.4%). In absolute figures the top 5 markets registered 37.610, 16.142, 13.921, 6.297 and 4.724 stay over visitors in the first three months of 2014. As previously mentioned in the February visitor arrivals performance, the CTB is well aware of the current airlift challenge. It is clear that the loss of seat capacity on different routes compared to last year is affecting the overall stay over figures. Furthermore, last year, March 2013 was the best performing month in visitor arrivals. The challenge to maintain equal number of visitors with an airlift challenge and the political situation in Venezuela explains the drop in visitor arrivals. CTB continues to engage in several large scale promotions in different markets in an effort to close this gap. The preliminary visitor statistics collected by the CTB show that 35.553 stay over visitors arrived to the island in March 2014. This figure is a 12% decrease compared to the arrival figures recorded for the same month last year. In 2013 CTB recorded 40.443 stay over visitors in the same month. In March 2014 all markets registered a decrease in visitor arrivals. The European market recorded a slight 1% decrease. The region provided a total of 15.991 stay over arrivals compared to the 16.135 recorded in March 2013. The main producing country, The Netherlands increased by 8% with 12.004 in March 2014 compared to 11.088 in 2013. Germany decreased recording 20% less visitors in March 2014. A total of 1.823 German visitors were welcomed. Last year this same month recorded 2.266 German visitors. The South American market decreased by 34% in March 2014, with a total of 7.171 stay over arrivals compared to 10.809 in 2013. The current situation in Venezuela reflects back in the arrival figures. A total of 4.451 visitors were registered during March 2014. This is a 41% decrease from Venezuela. Brazil registered an increase in stay over arrivals. In total 871 stay over visitors were registered from this country. Last year CTB recorded 594 visitors this is a 47% increase. Stay over arrivals from North America decreased by 8% in March with a total of 7.560 visitors compared to the 8.176 visitor arrivals March 2013. The United States with 5.455 stay over arrivals recorded a 13% decrease. Canada recorded a 10% increase with 2.105 stay over arrivals this March 2014. This increase is due to the result of marketing actions combined with three weekly flights from Toronto (West Jet, Air Canada and Sunwing). In 2013 we had two weekly flights to Curaçao from Canada (West Jet and Air Canada). Stay over visitors to Curaçao from the Caribbean region decreased by 20% in March 2014. A total of 2.626 visitors are registered. Aruba registered a decrease of 20%. In 2014 1.254 arrivals are recorded from this country.